As the Countdown to Christmas continues, I thought I would share my current favorite Christmas cookie. My brother-in-law sent this recipe to my older sister with the following message: “Please pass this recipe on to your sisters.” Sarah is not much of a baker and thus, he was wise pass it on to other Stewart women. I made these last week and they are now in Kingston (with me) waiting for Brendan to come and eat them. Preheat oven to 350 F. Beat butter and sugar in large bowl until light and fluffy. Gradually add flour, beating until well blended after each addition. Roll dough into 20 balls, approx. 3.5 cm in diameter. Flatten with palm of hand. Top each with 1 piece of chocolate, wrap dough around chocolate to completely enclose the chocolate. Place 5 cm apart on ungreased baking sheets. Flatten slightly. Bake 20 minutes. 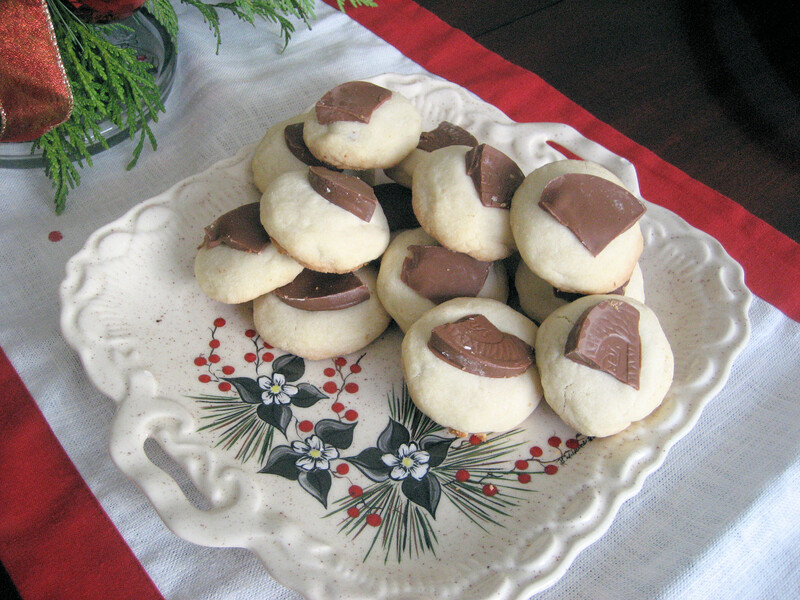 Remove from oven; immediately place 1 of the remaining chocolate pieces on each cookie. Transfer cookies to wire racks and let cool at least 10 minutes before serving. I have also made these with Caramilk bars and mini Reese Peanut Butter Cups. My favorite is the Chocolate Orange, a classic really.